Replacing Struts On A Car - Step by Step Process! Replacing Struts On A Car – Step by Step Process! Sometimes, replacing struts in a car can be essential to ensuring that the driver has a comfortable ride. Over a certain number of miles the shock absorbers in the suspension become loose, and changing the strut arrangement can make a significant difference. However, although most people understand the importance of struts, they are unsure exactly how to replace struts and make the changes which will ensure that these parts are taken out and replaced accurately. This is why they need a step-by-step process to help them. The first step is to start unscrewing the wheels. Make sure not to remove them completely, but then go to the hood of the car and remove the bolts which hold the parts in place. This is only for a front strut replacement, as back ones will have to be removed from the rear. When the bolts have been removed, jack up the car, and secure it in position. Make sure that both the jack and any supports are securely in place, but also that there is enough room to work alongside those supports without knocking them over. When the car is in the air, it will then be possible to start replacing struts. The strut towers need to be found, and then the bolts around them removed. It is possible that the suspension assembly will wobble, and even that the part to be replaced will fall onto the floor. The bolts will also have to be removed from the other end of the device, including those near the steering wheel. 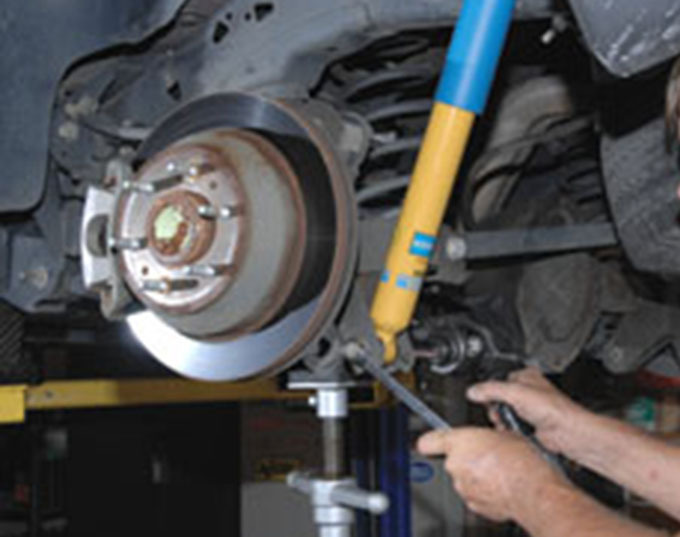 If it is necessary to do a complete shocks and struts replacement, then remove the shocks at this stage, too. The shocks will need to be replaced before the next step. Once that has been done, fit the coil spring and ball bearing on to the end of the replacement strut. This is the same for a front or rear strut replacement. Take the compressor device, and use it to tighten the spring. Make sure that this part of the process is done safely, otherwise the spring may recoil with some force. Over the top of the spring, put any rubber parts, and then hold the assembly in position while screwing the bolts back into position. Work around the bolts, making sure to support the assembly while this is done. When that has finished, put the wheel back on, and then lift the jack in order to remove the supports. The car can then be lowered. Make sure that all the parts are properly fixed before driving off. This method of replacing struts can seem rather difficult for someone with an ordinary garage, but in fact it can be a very good way of saving money. Car repair shops will have a much higher strut replacement cost, plus fees, than it could cost to fix the device at home. Saving money like this, as long as the items are correctly fitted, will leave more money in the wallet for other things.